Olive trees are an iconic and integral part of the Italian landscape, and while Italy is the second largest producer of olive oil after Spain, no other country is more highly associated with olive oil, from the romantic images of olive groves in Tuscany, to the oil’s dominant influence in nearly every Italian recipe, from pasta, fish and vegetables to cake. Throughout the highly diversified climates of Italy’s different regions, there are an estimated 2.5 million acres devoted solely to olive trees. Many of these olives are truly ancient specimens, some being several hundred years old. Being the second largest producer worldwide, Italy contributes roughly 20% of the total world production. While the Southern regions of Puglia, Calabria, Basilicata and Sicily produce the largest quantities of olive oil in the country, other unique, premium quality extra virgin olive oils are produced all over Italy, not only in the well-known regions of Tuscany and Umbria, but also in the lesser-recognized regions of Lazio, Molise and Trentino Alto Adige. In fact, olive oil is produced in every single region of Italy except the northernmost Alpine region of Valle D’Asota. With over 500 varieties of olives on record, no other country offers such a wide range of olive oils with diverse flavor profiles than Italy. The uniqueness of Italian olive oil is that each region cultivates the olives very specific to its land. Notable regional varieties include Nocellara from Sicily, Coratina and Peranzana from Puglia, Moraiolo and Frantoio from Tuscany, and Itrana from Lazio. Premium Italian extra virgin olive oil is almost exclusively produced by family-owned estate operations who often own their own frantoio (crushing mill) and oversee every step of the process, from tree to bottle. It is these small dedicated producers who account for much of Italian olive oil’s excellence. While olive oil quality in Italy has come under the radar recently in the press, due to the importing and repacking of often lower-quality olive oil from other countries to meet the world demand for “Italian” olive oil, it is all the more important to acknowledge the hard-working, smaller estate producers whose hearts and livelihoods are dedicated to producing some of the most honest, best Italian extra virgin olive oil in the world. 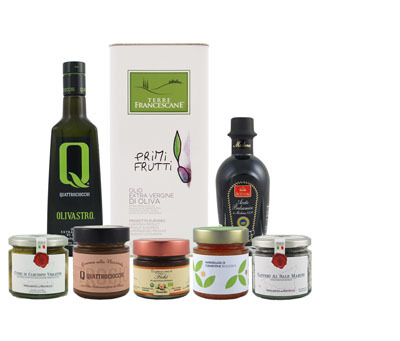 Our on-line olive oil shop offers the opportunity to buy an extensive selection of exceptional oils personally-selected by our management team from award-winning producers Frantoio Franci, Frantoio Pruneti, Gradassi, Viola, Agraria Riva del Garda and Quattrociocchi and include smaller, lesser-known high-quality brands such as Olio Guglielmi, Sciroppo, Fratelli Masturzo and Le Masciare.